Contrary to popular belief, your garage door opener isn't the part that's doing the heavy lifting when it comes to opening and closing the door. That job falls onto the springs, which is why their lifespan is very limited, and also why they must only be replaced by professional technicians. The amount of strain these components go through on a daily basis makes any replacement or adjustment attempt very risky if you don't possess the necessary skills and experience. Garage door springs work by providing tension based force that helps the panels move. As the panels lower, these components are reloaded with that tension and store it for future use (i.e. next time the door will need to be opened). As a result, this state of constant stress makes them gradually wear out. 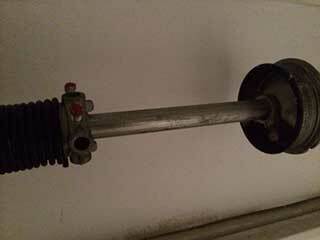 Knowinga garage door spring broke is easy, as the sudden release of tension often results in a loud BANG. Also, using your door will probably be impossible after that happens. Not only that, it will be dangerous to even try and lift it. Since the process of spring replacement involves releasing and reloading a high amount of tension, it should be left to the experts. That's where our team comes in. Extension springs are the older of the two types that are used today. They work by stretching and contracting as the door closes and opens, and therefore their lifespan is shorter than their counterparts (whom will touch on in a moment). They are installed in pairs, perpendicular to the door, one on each side. They are often attached with safety cables that serve as, well, safeguards that are meant to keep them in place in the event that they break. Garage door torsion springs work very differently. They are larger, more durable and flexible, and often a single unit will be sufficient. This unit will be installed horizontally above the panels, and attached at each end with drums that wind and unwind cables that connect to the bottom of the panels. Torsion springs work by twisting and unwinding, essentially using torque to achieve the goal of promoting the opening action of the door. Since both of these spring types operate under a lot of stress, replacing them can be dangerous. When they break, the tension they've been storing gets suddenly released, and they can whip around and cause severe lacerations to anyone standing nearby. That’s why you need to contact our experts at Garage Door Repair Champlin for any spring related problem you have. We'll take care of any replacement or adjustment quickly and safely.